Electrical conductivity is mainly governed by chemical composition and the temper state of a conductor. 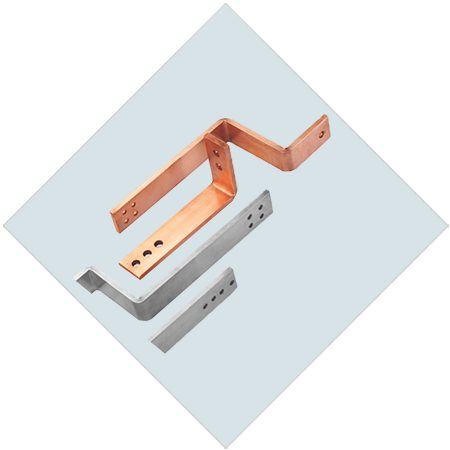 RR Busbars & Tapes are made from registered cathodes of Grade “A” type LME having copper purity of 99.99%. This high purity input give RR products high electrical conductivity of 100% IACS (International Annealed Copper Standard). This level of high conductivity is desirable for accurately designing electrical instruments. We use smart process controls which impart fine grain structure to the final product. This fine grain structure gives good formability to bus bars, shows no cracks on bending and is suitable for making intricate parts of electrical machines. Our products have glittering surface finish, a twist & bend free flatness. The extrusion drawing dyes angle design, drawing machine and high quality dyes gives our products a flawless shiny surface finish, matching all international standards and the right flatness for jointing purpose making it a perfect for connection application. Our products can be joined by soldering, brazing, oxyacetylene welding and gas shield arc welding without adverse effect.